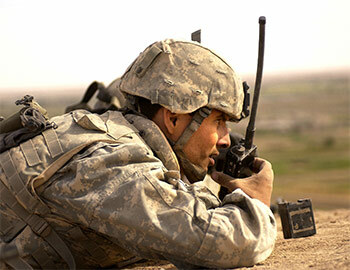 Software Defined Radio (SDR) technology was created to improve interoperability between different wireless networks, field radios, and devices. Comprised of both software and hardware, SDR technology enables developers to create multi-mode, multi-band, and multi-functional wireless devices and network equipment that can be dynamically reconfigured, enhanced, and upgraded through software updates and hardware reconfiguration. The Green Hills Platform for Software Defined Radio delivers a complete, standards-based reference platform for developing and deploying SDR systems ranging from the armed forces Joint Tactical Radio Systems (JTRS) to public safety radios as well as commercial small form-factor reconfigurable radios. The Green Hills Platform for SDR provides a complete operating environment compliant with the latest POSIX and SCA standards. Dramatic reduction in time to market. By choosing a complete solution, developers can immediately start working on waveform development and specific features that differentiate their products in the market. The optional integrated modeling and development tools further reduce time to market, by reducing design and debugging time during product development. A complete set of tightly integrated tools. The tools integrated with the platform encompass the SDR development cycle from design to deployment as well as provide every level of visibility right down to kernel aware source code debugging. Broad hardware, tools, and middleware support. The platform has been integrated and tested on a range of hardware reference platforms targeted at military, public safety and commercial SDR markets and comes with optional SCA based development tools and middleware from industry leading SDR solution providers. Reliability and security. The platform has been integrated and tested by SCA experts and deployed in multiple, successful products. Since the platform is based on Green Hills Software's INTEGRITYreal time operating system (RTOS), the applications and waveforms are protected from each other and any intentional or unintentional attacks. INTEGRITY is the only commercially available RTOS technology certified to Evaluation Assurance Level 6+ (EAL6+) for the internationally recognized Common Criteria security standard. EAL6+ represents the U.S. government's mapping of "high robustness" to the Common Criteria. High robustness is the level of security recommended when a communications device is managing high value information in a high threat environment. Multicore and virtualization. INTEGRITY's advanced multicore support coupled with INTEGRITY Secure Virtualization allows the consolidation of legacy applications, waveforms, and guest operating systems onto a single device enabling lower power consumption and reduced BOM costs. Significantly reduced production costs. The Green Hills Platform for Software Defined Radio offers the industry's most cost-effective, comprehensive bundle of software and reference hardware platforms for building SDR-enabled devices. SDR-enabled handsets and network equipment can be dynamically programmed to reconfigure the hardware's and software's characteristics by changing the executing communication waveforms. This is achieved by implementing a set of clearly-defined standard APIs that reside on top of a flexible hardware and software platform. The JTRS program has been a major driving force behind SDR technology advancement and is responsible for the creation of the Software Communication Architecture (SCA) standards. The Green Hills Platform for SDR delivers a variety of complete SCA OE solutions that are compliant with the latest POSIX and SCA standards. The Platform for SDR also provides integrated, host-based tools for every aspect of development, debugging, optimization, and deployment as well as a variety of integrated hardware platforms. In addition, Green Hills and its SCA OE partners are constantly tracking the future standards and profile directions of the SCA and plans to continue support for new profiles and standards in the future. With INTEGRITY you can isolate the networking stack, waveforms and file systems into separate protected address spaces. INTEGRITY RTOS is the first operating system to be certified to the latest IEEE POSIX.1-2003 specification, building on its mature SCA v2.2.2 API conformance. 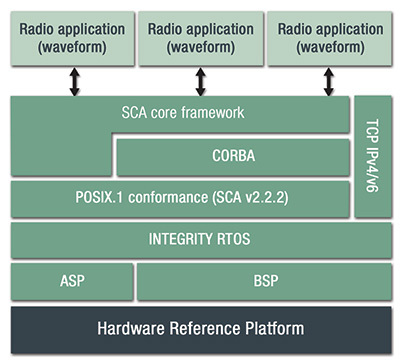 To date, INTEGRITY has been used on more SDR programs that depend on the SCA v2.2.2 interface than any other RTOS. Architected for security, reliability and performance, INTEGRITY provides the most robust foundation available for any SDR platform development. INTEGRITY provides CPU time, memory, and file system resource guarantees for critical radio applications and SDR waveforms. Its brick wall partitioning ensures that applications and waveforms always have the resources needed to run and won't corrupt other executing applications or waveforms. INTEGRITY's virtual device driver support provides the added security and reconfigurability SDR devices require. With INTEGRITY you can isolate the networking stack, waveforms and file systems into separate protected address spaces and control the access, flow of information, and availability of system resources to applications in other protected parts of the system. The optional Partitioning Journaling File System (PJFS) extends INTEGRITY's quality-of service guarantees into the file system by enabling developers to assign portions of the file system to specific applications and guarantee consistent, deterministic file access for the intended application. INTEGRITY's PJFS protects against unintended file access or corruption from external sources. Finally, the PJFS journaling capabilities ensure complete file system recovery and rapid boot after an unintentional system power loss or system failure. 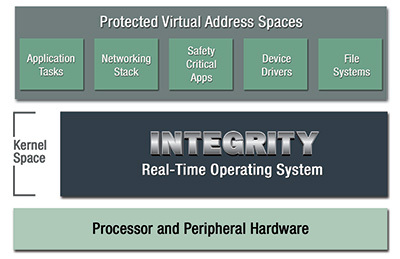 Deployed since 2003, INTEGRITY Secure Virtualization is the industry's most powerful, reliable, and flexible embedded virtualization solution. As shown in the figure, the platform can host arbitrary guest operating systems alongside a comprehensive suite of real-time applications and middleware. Applications and guest operating systems are flexibly scheduled across one or multiple cores, can communicate efficiently with each other, and utilize system peripherals according to a strict access control model. An invaluable part of the TimeMachine tool suite, the PathAnalyzer provides a view of your application's call stack over time. This powerful display makes complex system execution flow easy-to-understand, enabling you to find bugs faster. Green Hills Software's MULTI integrated development environment (IDE) includes the industry's most powerful and proven tools for developing embedded software with maximum reliability, maximum performance, and minimum code size. With the MULTI's sophisticated, intuitive capabilities, you can develop, debug, and optimize code more quickly, significantly reducing both development cost and time. MULTI supports more target processors, operating systems, and third-party tools than any other IDE—making it ideal for enterprise-wide deployment. By using a common set of development tools across projects, medical device developers can share code more easily or move between projects without compromising productivity. With MULTI, you can develop code in C, C++, EC++, MISRA C, and Ada. 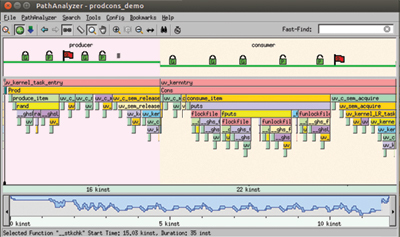 Green Hills Software's TimeMachine debugging suite extends MULTI's capabilities by enabling visual analysis of execution to improve application reliability and reduce development time. Medical device developers can use these tools for code coverage testing, forward and backward debugging and performance profiling. Green Hills Software's DoubleCheck integrated static analyzer provides built-in static code analysis that is tightly integrated with the compiler technology, ensuring that the same code analyzed is the same code deployed, mitigating risk in the safety-critical development life cycle. TCP/IP security and performance are key requirements for SDR devices. Green Hills Software's networking stacks provide the Platform for SDR with both high-performance throughput and maximum security by delivering a field proven dual-mode IPv4/IPv6 stack that has been through the rigors of TAHI, Moonv6 and IxANVL testing, providing additional product validation and completeness to users. Security options include SSL, SSH, IPSec, IKE, RADIUS and others. There is also a full line of wireless security available including WPA and WPA2 as well as Mobile IP node support.